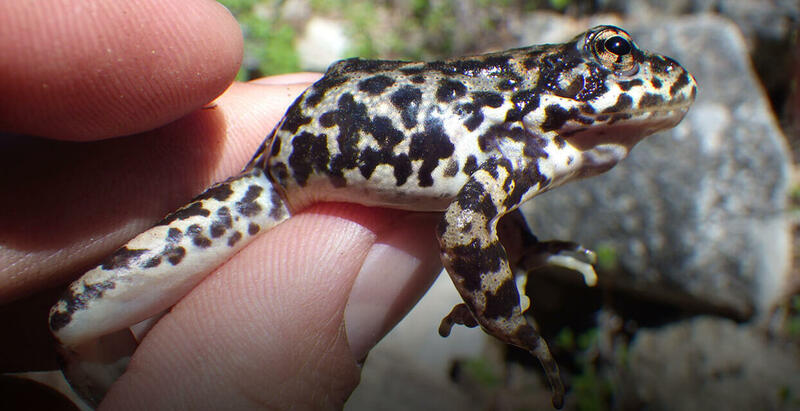 For the mountain yellow-legged frog, severe population fragmentation has led to population estimates of fewer than 200 individuals remaining in the wild. Along with our partners, our aim is to manage and propagate this species in captivity as part of a large-scale reintroduction effort. To date, our Recovery Ecology team has released hundreds of tadpoles back into high elevation mountain streams and monitored their continued success. The goal of our current work is to improve husbandry and breeding protocols in collaboration with the San Diego Zoo’s Reptile Department. To promote breeding, we emulate the seasons by providing a chilly environment to trigger hibernation in the frogs at the same time they would be inactive in the wild. We also simulate natural light cycles to stimulate reproduction, and study the frogs’ nutritional requirements to maximize health. Our ultimate goal is to rear froglets for reintroduction into the wild. Despite some breeding success, numbers of offspring produced every year remains low. To give the colony a boost, our Reproductive Sciences team uses assisted technologies to promote reproduction including hormone therapies and in vitro fertilization. To preserve the genetic diversity of this species over the long-term, we cryopreserve sperm for storage in the Frozen Zoo®.The first cell cultures from this species, established by our Conservation Genetics team, are being utilized for genome annotation and documenting genetic variation. Finally, to effectively manage the offspring we produce, we are conducting research on embryonic and tadpole development, as well as metamorphosis.We are the first and only team in the world to study the reproductive physiology and natural history of this species with the ultimate aim of developing management protocols that will help rescue these frogs from extinction.